For computers to work at all, bits—the ones and zeros that make up digital information—must be able to interact and hand off data for processing. The same goes for the quantum bits, or qubits, that make up quantum computers. But that interaction creates a problem—in any system in which qubits interact with each other, they also tend to want to interact with their environment, resulting in qubits that quickly lose their quantum nature. To get around the problem, Graduate School of Arts and Sciences Ph.D. student Ruffin Evans turned to particles mostly known for their lack of interactions—photons. "It's not hard to engineer a system with very strong interactions, but strong interactions can also cause noise and interference through interaction with the environment," Evans said. "So you have to make the environment extremely clean. This is a huge challenge. We are operating in a completely different regime. We use photons, which have weak interactions with everything." 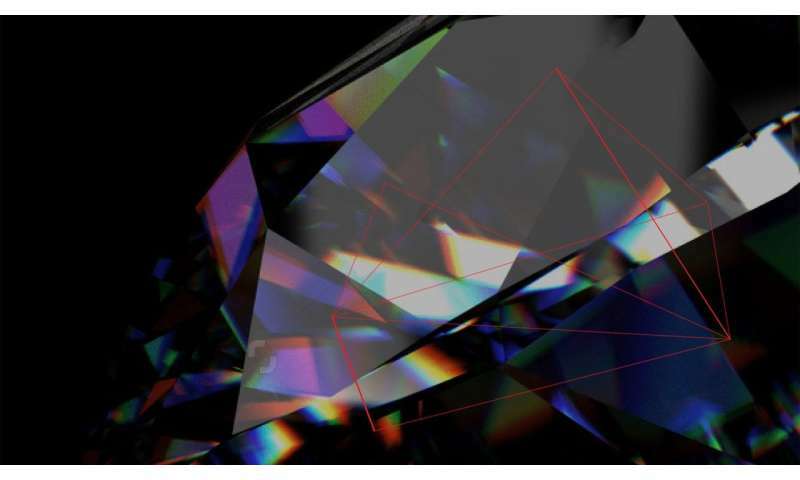 Evans and colleagues began by creating two qubits using silicon-vacancy centers—atomic-scale impurities in diamonds—and putting them inside a nano-scale device known as a photonic crystal cavity, which behaves like two facing mirrors. "The chance that light interacts with an atom in a single pass might be very, very small, but once the light bounces around 10,000 times, it will almost certainly happen," he said. "So one of the atoms can emit a photon, and it will bounce around between these mirrors, and at some point, the other atom will absorb the photon." The transfer of that photon doesn't go only one way, though. "The photon is actually exchanged several times between the two qubits," Evans said. "It's like they're playing hot potato; the qubits pass it back and forth." While the notion of creating interaction between qubits isn't new—researchers have managed the feat in a number of other systems—there are two factors that make the new study unique, Evans said. "The key advance is that we are operating with photons at optical frequencies, which are usually very weakly interacting," he said. "That's exactly why we use fiber optics to transmit data—you can send light through a long fiber with basically no attenuation. So our platform is especially exciting for long-distance quantum computing or quantum networking." 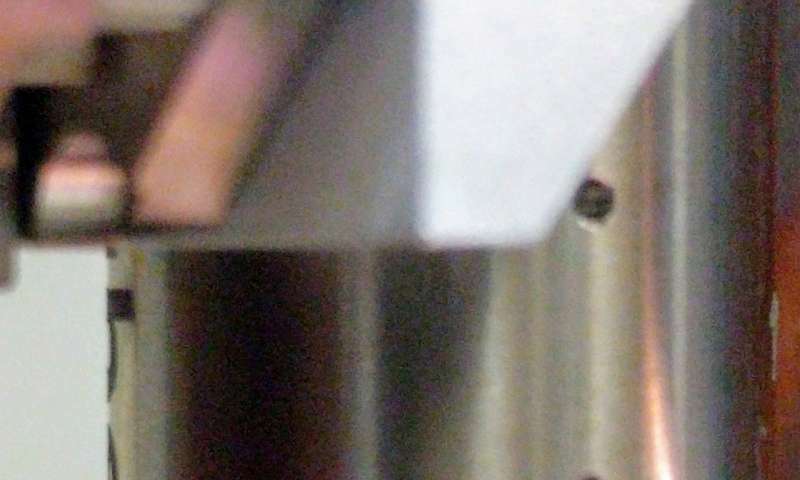 "Even though this sort of interaction has been realized before, it hasn't been realized in solid-state systems in the optical domain," he said. "Our devices are built using semiconductor fabrication techniques. It's easy to imagine using these tools to scale up to many more devices on a single chip." "The other direction is to say we can already build these devices, and take information, read it out of the device and put it in an optical fiber, so let's think about how we scale this up and actually build a real quantum network over human-scale distances," he said. "We're envisioning schemes to build links between devices across the lab or across campus using the ingredients we already have, or using next-generation devices to realize a small-scale quantum network." "Everything from a quantum internet to quantum data centers will require optical links between quantum systems, and that's the piece of the puzzle that our work is very well-suited for," he said. duh! Why are you using Research Terms! Like Photon? We know there are no photons! Your's is a probability functional relative only to your imagined energy function and some other probability of wavelets ganging up based upon some imaginary State? Define Realizability for me Please! All of us are not idiots! Light bouncing around? All charges respond to all changes in the Field. Thus define the geometrical requirements for whatever field attribute. It's geometrically possible to represent any event within any Defined Conditions! So at least define what you are wishing! By the way, the motion of the center of the creates visible light; however, the center of the fields are invisible. There are no particles! My Reality! My Logic!